In this recipe, the warm goat cheese croutons are the main focal point. They are substantial enough on their own to pair perfectly with a basic bed of mixed greens topped with a light drizzle of good olive oil and aged balsamic vinegar. They provide just enough warmth and crunch to elevate this otherwise everyday combination to a special treat. To make croutons, divide goat cheese into four 2-oz. portions. Press each 2-oz piece of goat cheese between 2 sheets of wax paper until they are about ½” thick. Remove the top layer of wax to finish shaping the cheese into uniform round disks with your hands. Replace wax paper and place in the refrigerator for about 30 minutes or until the disks are firm. Create a “breading station” by adding whisked egg white to a shallow dish, and the Panko breadcrumbs to another. Once firm, dip each goat cheese round into the egg whites until coated on both sides. Then dip the coated goat cheese rounds into the Panko breadcrumbs. Make sure each goat cheese round is thoroughly covered in breadcrumbs on both sides. In a small saucepan, heat coconut oil over medium-high heat until it starts to “dance.” Carefully add each coated crouton to the pan with a slotted spatula and turn as soon as the first side becomes golden brown. Remove from oil as soon as second side is equally browned and set on a wire rack. Don’t allow croutons to stay in hot oil too long or the goat cheese will become too melted to hold its shape. Divide salad greens among 4 plates and drizzle with olive oil and aged balsamic vinegar. Top each plate with a warm goat cheese crouton and season with salt and pepper, to taste. With the hulls intact, slice each whole strawberry into several equal-sized segments, starting from the bottom and working toward the green part. Don’t cut all the way through the strawberry in the process, however. 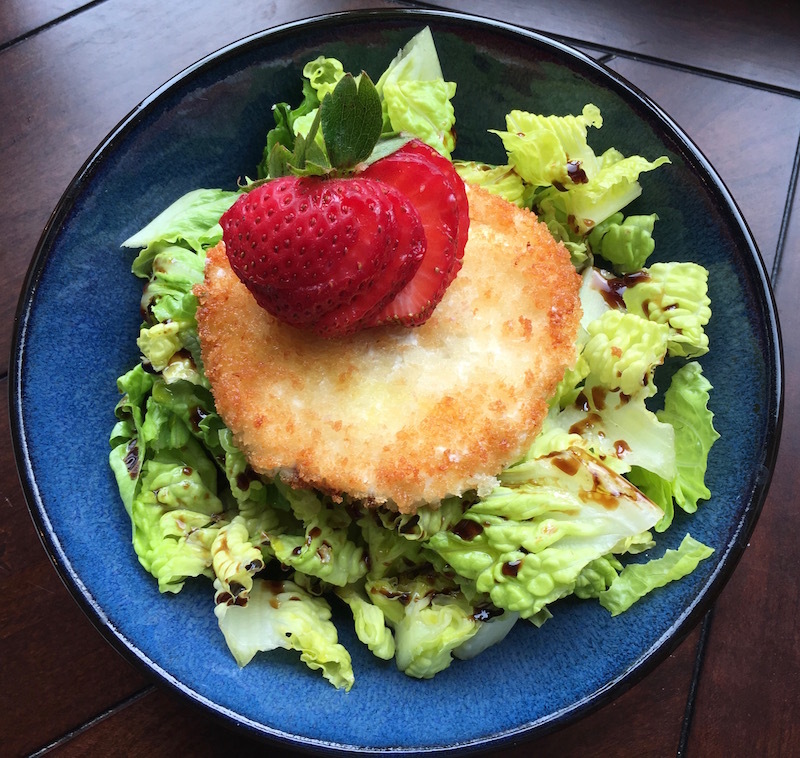 Gently spread the individual segments into a fan shape and place on top of each goat cheese crouton and serve.